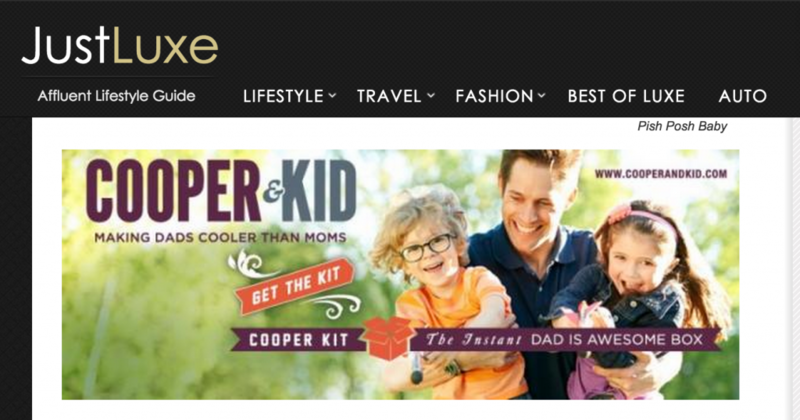 Congratulations to our Client Cooper & Kid for their feature on JustLuxe! For the father who wants to spend some more personal time with his kids, he should check out Cooper & Kid, a quarterly subscription box for dads that provides men with a fun, entertaining way to connect with their kids. Every three months, they will receive a box in the mail filled with hands-on themed projects that both dads and kids find cool. Each box is filled with specially curated products and activities centering around a chosen theme designed to entertain, engage, and create unforgettable memories between father and child. Fathers want to spend time with their kids doing the kinds of imaginative, inventive things that shape their character and relationship. Things they wonâ€™t ever forget. So, get them the Cooper Kit for the holidays. Check them out at cooperandkid.com!